For the fourth installment of Twelve Questions with Top Prospects, SoxProspects.com exchanged some questions and answers with Portland SP Charlie Zink. As you'd expect, a lot of interesting questions and answers about the knuckleball. Thanks a bunch to Charlie for taking time out of his busy schedule during the season! Here are his responses to the questions from the SoxProspects Community. 1. Hey Charlie, thanks for answering our questions. I’ll start it off - what’s your baseball background? Were you a dominating pitcher in high school/college? A good hitter? Play any other positions? Play any other sports? Charlie: Well, I didn't start playing baseball until I was 11, I had been Taekwondo from the ages of 6-12 so that took up all my time. Then, one day my friend’s dad asked me to play on his little league team so I decided to give it a shot. I went to the tryouts and got drafted before he could pick me so I wasn't even on the same team as my friend. My dad and I would always throw a football so I had a strong arm and pitching came very easy to me. In high school I played SS, 1B, and pitched. I put up pretty good numbers my senior year... I think I hit .480 with 10 home runs and was 10 -1 with a 1.00 ERA. I also threw a perfect game with a bunch of scouts there to watch me, but I didn't throw hard enough to impress anyone. So after getting some offers to go play at some small schools I ended up going to Sacramento City College. I didn't pitch a whole lot my freshman year but we did win the state championship and I got a nice ring. Then I went to Savannah College of Art and Design with Luis Tiant as my head coach. I finished in the top 5 in the nation for K/9 my last two years there. At this point, the scouts said I threw hard enough, but they didn't like my mechanics, so I ended up not getting drafted and wanted to give up on baseball. But I ended up getting the call to try out for the Red Sox and I'm still having fun playing baseball. 2. How did you become a knuckleballer? Every kid that ever picks up a baseball tries a knuckleball, and almost no one can actually throw it. Did it just come naturally to you, or did you decide one day you wanted to learn how to throw it? Charlie: I actually figured out how to throw the knuckleball when I was 11 I think. I saw Wakefield throwing it during the playoffs for the pirates and I was just fascinated. It came really easy to me and I would always throw it playing catch, However, I didn’t throw a knuckleball in a game until 2002. All of my coaches growing up said it was stupid and I shouldn't mess around with it. 3. We've heard varying reports that Tim Wakefield has given you advice on throwing the knuckleball. Anything specific that has helped? Have you ever worked or talked with any other former MLB pitchers such as Charlie Hough or the Niekros? Charlie: I worked with Wakefield a few times every spring training for the past four years. He has been really helpful in just teaching the little things that I never knew before about how to be consistent. I think I've learned the most by just watching him and seeing how he pitches in different situations. I also worked with Charlie Hough for about a week during spring training two years ago. He was extremely helpful and it was nice to have another person to talk to about the knuckleball. I would love to work with the Niekros, but the opportunity hasn’t presented itself. 4. Most knuckleball pitchers have blossomed late in their careers. Is it difficult to try and master such a tricky art while your fellow prospects are advancing above you? Charlie: It has been a little difficult not being able to play with the guys I have been coming up with for the past couple years, but I know if I keep pitching the way I have been and can stay consistent, I'll be playing with them soon enough. 5. Charlie, thanks for taking the time and best wishes on a long career. Which catchers in the organization have had the most success catching your knuckler? Have there been any that stand out? Charlie: One of my favorite catchers was Edgar Martinez. We had a great pitcher/catcher relationship. Recently I have really enjoyed throwing to Dusty Brown. I have a lot of confidence in him and he really helps to control the running game for me. 6. What is the mindset of a knuckleballer like? Are you pitching to avoid contact, trying to strike out guys, or just hoping to get the ball over? Do you try to spot each pitch in an exact location, or something else? Do you throw different varieties of knuckleballs to get different effects? Charlie: I'm always trying to get contact from the hitters. I try to pound the zone and when that happens I tend to have a lot of success. I never try to throw to a spot, I always try to throw it right at the catchers head and let the ball move wherever it wants to go. I will change speeds on the knuckleball and I tend to get the best movement when I'm throwing it 65-69, I will throw a slower one around 60 if somebody seems to be timing it well. 7. Have any of your teammates messed around with the knuckleball under your tutelage? Anybody stand a chance at mixing it into their repertoire? Have you worked with John Barnes at all? Charlie: Just about every day I have people throwing knuckleballs all around asking my advice. Its just one of those pitches that everyone fascinated by but not many can throw it. I wouldn't advise any of them to become a knuckleball pitcher anytime soon. I played catch one time with John Barnes in spring training and I hated it. Now I know why nobody likes to play catch with me, his ball moves a lot and he throws it pretty hard. 8. Are there any stadiums where your knuckleball works particularly better or worse than normal? What do you believe are the ideal weather conditions for throwing the knuckleball? Charlie: I really like throwing when its humid with a slight breeze blowing out to centerfield. Having the wind blow in my face helps the ball jump around a little bit more. Portland is a great place for me to pitch because the wind usually blows out to center and in the summer it gets nice and humid. 9. I was wondering about your secondary pitches. Besides the knuckleball, what pitches do you throw, how often and, how do you rate them? Charlie: Besides the knuckleball I throw a fastball around 80-86 and I also throw a cutter which I'll use when I think the hitter is waiting for a fastball. 10. Do you feel being shuffled up and down the organization the last few years has hurt your ability to develop consistency? Charlie: Not at all... I feel I have been developing quite nicely over the past couple years. 11. How would you rate your pick-off move and your ability to keep down stolen bases against you? Charlie: I think I have a pretty good pick-off move, and I have a good idea of what's going on in the game and when I need to be a little bit quicker to home. I really don't worry about it a lot anymore since I have Dusty Brown behind the dish. 12. In 2004, Baseball Prospectus ranked you as the 50th Top Prospect in all of baseball. Assuming you heard about it at the time, what was your reaction? In general, how much attention do you and your teammates pay to prospects rankings? Charlie: Honestly the whole "prospect" thing has come and gone with me. I don't worry about it anymore. I know I have to go pitch and get people out. That's all I can control. 4/30 Cup of Coffee: Buffalo blanked Pawtucket 6-0 yesterday. Kason Gabbard started and threw 6 scoreless innings. He gave up 4 hits and a BB. He had 5 Ks. Bryan Corey took the loss. He went 1 inning giving up 4 runs on 5 hits and 1 BB. His ERA is now 8.10. Javier Lopez pitched a scoreless inning. He gave up 2 hits. Mike Burns pitched the final inning allowing 2 runs on 2 hits. He had 1 K. Ed Rogers was the only player who had more than 1 hit going 2 for 5. New Hampshire defeated Portland 6-2. Tommy Hottovy (o-3) took the loss. He went 5 innings giving up 5 runs on 9 hits and a BB. He had 2 Ks. Barry Hertzler threw 2 scoreless innings allowing just 1 hit. Lincoln Holdzkom threw 1 inning giving up 1 run on 2 BB. Chris Smith pitched a perfect final inning fanning 1. Jeff Natale went 2 for 4. Eric Crozier went 1 for 3 with a run scored and a RBI. Bakersfield defeated Lancaster 7-5. Justin Masterson (0-2) started and took the loss. He gave up 3 runs on 9 hits and a BB in 5 innings of work. Tim Cox went 2 innings allowing 4 runs on 6 hits. He had 1 K. Chad Rhoades threw a scoreless inning giving up 1 hit. Christain Lara went 2 for 5 and scored a run. Zach Daeges went 1 for 3 with a home run and 3 RBI. Sal Paniagua went 1 for 4 with a home run. Augusta blasted Greenville 9-1. Brian Steinocher (1-4) started and took the loss. He went 4 2/3 innings giving up 6 runs on 11 hits. He did not allow a BB and had 2 Ks. Jorge Rodriguez threw the final 3 1/3 innings allowing 1 run on 3 hits and a BB. He had 1 K. Reid Engel went 2 for 3 and scored the Drive's only run. Ex Red Sox prospect Josh Hancock was killed in a tragic automobile accident on Sunday. The condolences of the SoxProspects community goes out to Hancock's family, friends, and teammates. 4/29 Cup of Coffee: In action on Saturday, Buffalo got by Pawtucket 10-7 in 11 innings. David Pauley started and went 6 innings. He allowed 4 runs on 5 hits. He did not walk a batter and had 6 Ks. Javier Lopez threw 1 scoreless inning fanning 1. Manny Delcarmen blew the save giving up 3 runs on 6 hits in 2 innings of work. He had 2 Ks. Travis Hughes took the loss. He threw 2 innings giving up 3 runs on 3 hits and a BB. He had 2 Ks. David Murphy went 3 for 5 with a run scored and a RBI. Brandon Moss went 2 for 4 with a home run and 2 RBI. He is now hitting .314. Joe McEwing had a great night going 4 for 5 with 2 runs scored and a RBI. Portland doubled New Hampshire 10-5. Charlie Zink went the first 6 innings and earned the win. He did not allow a run on 3 hits and 2 BB. He had 5 Ks. Bryce Cox threw 1 1/3 innings giving up 5 runs on 3 hits and 3 BB. He did not have a strike out. Mike James pitched the final 1 2/3 frames. He did not allow a run on 1 hit and a BB. He had 3 Ks. Cory Keylor went 3 for 5 with a home run, 2 runs scored and 5 RBI. Jeff Natale went 2 for 4 with 2 runs scored and 2 RBI. Andrew Pinckney went 2 for 4 and scored a run. Lancaster defeated Bakersfield 7-3. Kris Johnson started and went 5 innings giving up 3 runs on 4 hits and 3 BB. He had 4 Ks. Hunter Jones went 2 scoreless innings. giving up 1 hit and 1 BB. He had 1 K. Jason Blackey went 2 scoreless innings giving up 3 hits and a BB. He had 2 Ks. Bubba Bell went 3 for 5 with a run scored and a RBI. Tony Granadillo went 2 for 4 with a run scored and a RBI. Mark Wagner went 1 for 3 scoring a run while driving in 2 others. In the SAL, Augusta blanked Greenville 3-0. Dustin Richardson went 5 2/3 innings. He gave up 3 runs on 2 hits and 4 BB. He had 5 Ks. Kyle Fernandes threw 2 1/3 scoreless innings allowing 2 hits and 2 BB. Argenis Diaz went 2 for 3 in the game. 4/28 Cup of Coffee: Pawtucket defeated Buffalo 5-1. Jon Lester made his first rehab start at the AAA level. He went 5 scoreless innings giving up 3 hits. He did not walk a batter while striking out 6. Craig Breslow went 2 scoreless innings. He gave up 1 hit while fanning 2. Edgar Martinez went an inning to pick up the win. He gave up 1 run on a home run. Craig Hansen pitched a perfect ninth. He had 1 K. Joe McEwing went 1 for 3 with a home run. David Murphy went 1 for 3 with a run scored and 2 RBI. Portland defeated New Hampshire 6-2. Matt Goodson earned the win going 5 innings. He gave up 2 runs on 3 hits and 4 BB. He had 2 Ks. Kyle Jackson threw 2 scoreless innings. He did not allow a hit. He walked 1 and had 3 Ks. Beau Vaughn pitched 2 scoreless innings. He allowed 1 hit and had a K. Jacoby Ellsbury went 4 for 4 with 2 runs scored. He raised his BA to .468. Dusty Brown went 2 for 5 with a run scored and a RBI. Bryan Pritz went 2 for 3 with a RBI. Bakersfield outslugged Lancaster 12-10. Daniel Bard started and went 2 2/3 innings. He allowed 6 runs on 4 hits and 6 BB. He had 4 Ks. Ismael Casillas threw 3 1/3 innings giving up 4 runs on 4 hits and a BB. He had 6 Ks. Kevin Guyette gave up 2 runs on 4 hits in 2 innings of work. He had 2 Ks. Jay Johnson went 3 for 5 with a run scored and 2 RBI. Bubba Bell went 3 for 6 with a run scored and a RBI. Zach Daeges went 3 for 6 with a home run, 3 runs scored and 2 RBI. Tony Granadillo went 2 for 4 and scored a run. Luis Soto went 2 for 5 with a RBI. Greenville defeated Augusta 7-4. Chris Jones threw 5 1/3 innings and earned the win. He gave up 4 runs on 5 hits and 2 BB. He had 6 Ks. T.J. Large went 2 2/3 perfect innings. He had 3 Ks. Josh Papelbon pitched a perfect ninth to earn his 5th save. Jason Place went 1 for 4 with a run scored and 2 RBI. Manny Arambarris went 1 for 3 with 2 RBI. Zak Farkes went 1 for 4 with 2 runs scored and 1 RBI. Pawtucket had the night off and will resume action tonight against Buffalo. Portland lost to New Britain 11-8. Andrew Dobies started and threw 5 2/3 innings. He gave up 6 runs on 7 hits. He did not walk a batter while striking out 9. Chris Smith went 1 1/3 innings. He allowed 1 run on 4 hits and a BB. He had 1 K. Barry Hertzler threw a scoreless inning giving up 1 hit. Mike James blew the save and was tagged with the loss. He went 1/3 of an inning giving up 4 runs on 3 hits and a BB. Jacoby Ellsbury went 2 for 5 with 2 runs scored and a RBI. He is now hitting .431. Jeff Natale went 2 for 3 with a run scored and a RBI. Lancaster defeated San Jose 10-6. Mike Bowden went 6 innings giving up 3 runs on 5 hits and a BB. He had 9 Ks. Chad Rhoades threw 1 2/3 innings. He gave up 2 runs on 3 hits. He did allow a BB and had 2 Ks. Blake Maxwell blew the save but picked up the win. He gave up 1 run on 2 hits and a BB. He had 1 K. Bubba Bell went 2 for 3 with a run scored and 2 RBI. Zach Daeges went 3 for 5 with a run scored and a RBI. Scott White went 1 for 4 with a home run and 3 RBI. Mark Wagner went 2 for 4 with a run scored and a RBI. He is hitting .368. Finally in the SAL, Augusta downed Greenville 8-1. Travis Beazley took the loss. He lasted 4 2/3 innings giving up 7 runs on 11 hits and a BB. He had 2 Ks. Miguel Socolovich went 1 1/3 innings giving up a run on 2 hits. He had a K. Eric Beattie went 2 scoreless innings. He gave up 2 hits and 3 BB. He had a K. Argenis Diaz went 1 for 4 with a run scored. Lars Anderson went 1 for 3. Player of the Night: Zach Daeges who went 3 for 5 driving in a run and scored another. 4/26 Cup of Coffee: Due to the weather and scheduling, this morning's Cup of Coffee is a small one. Pawtucket saw their game against Rochester postponed due to rain and as a result Jon Lester's first rehab start at AAA had to be pushed back. The Portland/ New Britain game was also a victim of the weather. In California, Lancaster defeated San Jose 9-5. Mike Rozier earned the victory going 6 innings. He allowed 2 runs on 3 hits and 2 BB. He had 5 Ks. Hunter Jones went 2 innings giving up 3 runs on 4 hits and a BB. He had 2 Ks. Jason Blackey pitched a perfect ninth striking out 2. Bubba Bell went 1 for 3. He scored 3 runs and had a RBI. Zach Daeges went 2 for 3 and scored 2 runs. Chuck Jeroloman went 2 for 4 and scored a run. Jay Johnson went 1 for 3 with a run scored and 3 RBI. Greenville was not scheduled to play last night. Player of the Night: Mike Rozier who earned his first win of the season for Lancaster. Top prospect Jacoby Ellsbury blew away the competition earning 72.4 percent of votes cast this week to win SoxProspects.com Player of the Week honors. Ellsbury hit at a .667 clip (8/16) with a double and two triples on the week, continuing what has been a strong season so far for the SoxProspects.com top rated prospect (.434/.483/.660 as of this writing). 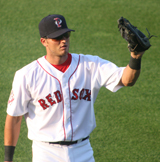 The 23-year-old lefty hitting Portland center fielder was the Red Sox Minor League Defensive Player of the Year and Minor League Base Runner of the Year in 2006, as well as a SoxProspects.com pre-season all all star (2006 & 2007). Also receiving votes this week were Lancaster's Michael Bowden for his continued strong performance in the Cal League and Greenville C Zack Farkes, who hit four homers on the week. 4/25 Cup of Coffee: In action last night, Rochester defeated Pawtucket 5-2. Devern Hansack started and took the loss. He went 6 1/3 innings giving up 5 runs on 10 hits. He did not walk a batter and had 3 Ks. Craig Breslow threw a clean 2/3 of an inning with a single K. Manny Delcarmen threw 1 perfect inning fanning 1. Brandon Moss was 1 for 2 with a run scored. George Kottaras went 1 for 4 with a home run and 2 RBI. Portland wasted an excellent outing by Clay Buchholz and lost 5-4 to New Britain in 11 innings. The young Texas righthander went 5 1/3 innings and did not give up a run. He allowed 2 hits and a BB. He had 8 Ks. Bryce Cox went 2 innings giving up 4 runs on 3 hits and 2 BB. Mike James blew the save and took the loss allowing 1 run on 3 hits. He had 2 Ks. Jacoby Ellsbury went 2 for 5 with a RBI. Jeff Corsaletti went 1 for 3 with a run scored and a RBI. Cory Keylor went 4 for 5 with a run scored and a RBI. Lancaster came from behind to edge San Jose 10-9. Justin Masterson went 6 innings allowing 8 runs on 12 hits and 2 BB. He had 4 Ks. Tim Cox blew the save and then earned the win. He went 2 innings giving up 1 run on 2 hits. Chad Rhoades thre a perfect ninth striking out 1. Bubba Bell went 2 for 3 with a homer, 3 runs scored and 2 RBI. Sal Paniagua went 1 for 5 with a home run, a run scored and 2 RBI. Luis Soto went 2 for 4 and scored a run. Zach Daeges went 2 for 5 with a run scored and a RBI. In the final game of the night, Asheville blanked Greenville 8-0. Jordan Craft took the loss. He gave up 3 runs on 3 hits and 2 BB in 2 2/3 innings. He had 5 Ks. Adam Blackley went 2 1/3 scoreless innings. He gave up 2 hits and a BB. He had 4 Ks. Jorge Rodriguez went an inning giving up 2 runs on 2 hits and a BB. T.J. Large went 2 innings allowing 3 runs on 2 hits. He had 3Ks. Josh Papelbon pitched a scoreless inning giving up 1 hit while recording a single K. Lars Anderson went 2 for 4 and is now hitting .348. Player of the Night: Clay Buchholz who threw 5 1/3 scoreless innings allowing just 2 hits while fanning 8. 4/24 Cup of Coffee: Last night, Pawtucket jumped ahead of Buffalo 3-0 in the first inning and then rain and wind led to the suspension of the contest. Brandon Moss had homered in the top half of the first to give the the team the lead and Kason Gabbard had retired the first two Buffalo hitters when the game was halted. Portland defeated New Britain 8-5. Jeff Natale went 4 for 5 with a run scored and 2 RBI. Cory Keylor went 2 for 4 and scored 2 runs. Andrew Pinckney went 2 for 4. Eric Corzier went 2 for 4 with a home run and 2 RBI. Tommy Hottovy started the game and went 4 1/3 innings. He gave up 3 runs on 3 hits and 3 BB. He had 1 K. Kyle Jackson got the win going 1 1/3 innings. He allowed 2 runs on 3 hits and 3 BB. Lincoln Holdzkom pitched 2 scoreless innings. He allowed 2 hits and a BB. He had 2 Ks. Beau Vaughn threw 1 1/3 innings. He did not allow a run on 1 hit. He had 2 Ks. Lancaster defeated Inland Empire 8-5. Kris Johnson started and got the win. He went 5 innings allowing 2 runs on 2 hits and 4 BB. He had 4 Ks. Kevin Guyette went 2 scoreless innings. He gave up 1 hit while fanning 2. Blake Maxwell pitched the final 2 innings. He gave up 1 run on 3 hits. Christian Lara went 2 for 4 with a run scored and 2 RBI. Bubba Bell went 1 for 4 with a home run and 2 RBI. Mark Wagner went 2 for 4 with 2 RBI. Iggy Suarez went 2 for 4 with a run scored and a RBI. Asheville defeated Greenville 6-2. Brian Steinocher took the loss going 4 2/3 innings. He allowed 6 runs on 9 hits and a BB. He had 3 Ks. Kyle Fernandes threw 3 1/3 innings. He did not allow a run on 1 hit. He had 2 Ks. Eric Beattie pitched a scoreless ninth allowing 2 BB. Jason Place went 1 for 3 with a home run. Lars Anderson went 1 for 4 with a home run. Player of the Night: Jeff Natale who went 4 for 5 with a run scored and 2 RBI for the Sea Dogs. 4/23 Cup of Coffee: With the parent team sweeping their vaunted rivals over the weekend, a Monday morning cup of coffee never tasted quite so sweet. Pawtucket defeated Buffalo 6-1. Abe Alvarez started and earned the win. He went 5 innings giving up 1 run on 2 hits and 3 BB. He had 3 Ks. Travis Hughes threw 3 scoreless innings. He allowed 1 hit and a BB. He had 3 Ks. Edgar Martinez finished off the game with a scoreless ninth. He gave up 1 hit. Ed Rogers went 2 for 5 and scored a run. David Murphy went 2 for 4 with a home run, 2 runs scored and 2 RBI. Brandon Moss went 2 for 4 with a home run and 2 RBI. New Hampshire edged Portland 4-3. Charlie Zink went 6 innings giving up 1 run on 1 hit. He walked 5 and had 5 Ks. Chris Smith blew the save and took the loss. He went 2 1/3 innings allowing 3 runs on 4 hits. He did not allow a BB while recording 2 Ks. Mike James finished the final 1/3 of an inning giving up 1 hit and a BB. He had 1 K. John Otness went 3 for 4 and scored a run. Jacoby Ellsbury went 1 for 4 and had 2 RBI. Bryan Pritz went 1 for 3 with a run scored. Inland Empire defeated Lancaster 11-6. Daniel Bard started and took the loss. He lasted 2 1/3 innings. He gave up 6 runs on 5 hits and 4 BB. He had 2 Ks. Mario Pena went 3 2/3 innings. He gave up 2 runs on 7 hits. Ismael Casillas threw 2 innings giving up 3 runs on 3 hits and 2 BB. He had 3 Ks. Jason Blackey pitched a perfect final inning. Jay Johnson went 2 for 5 and scored a run. Mark Wagner went 2 for 4 and scored twice. Scott White went 2 for 4 with a home run and 3 RBI. Greenville edged Asheville 4-3. Dustin Richardson started and went 5 innings. He did not allow a run on 2 hits. He gave up 1 BB while striking out 8 Asheville hitters. Miguel Socolovich blew the save but earned the win. He went 1 2/3 innings allowing 3 runs on 2 hits and 2 BB. He had a K. T. J. Large pitched 1 1/3 scoreless innings allowing just 1 hit while recording 2 Ks. Josh Papelbon threw a perfect ninth. He had 2 Ks. Argenis Diaz went 2 for 4. Manny Arambarris went 2 for 3 with a run scored and a RBI. Jason Place went 1 for 3 with a RBI. Mickey Hall went 1 for 3 with a run scored and a RBI. Player of the Night: Dustin Richardson who did not allow a run over 5 innings while striking out 8. 4/22 Cup of Coffee: The beautiful spring weather has arrived in the Northeast and a cup of coffee is a perfect tonic to begin a great day. Pawtucket got by Buffalo 5-3. Runelvys Hernandez went 2 innings. He did not allow a run on 1 hit and a BB. He had 1 K. Bryan Corey went 2 1/3 innings. He gave up 2 runs on 3 hits. He had 2 Ks. Javier Lopez picked up the win allowing 1 run on 3 hits and 3 BB in 3 innings of work. Craig Hansen earned the save going 1 2/3 scoreless innings. He allowed 1 hit and a BB while fanning 2. Ed Rogers went 3 for 5 and scored a run. Bobby Scales went 2 for 4 with a home run and 3 RBI. David Murphy went 2 for 4 and scored a run. Portland doubled New Hampshire by the score of 4-2. Matt Goodson started and went 4 innings allowing 2 runs on 3 hits and 3 BB. He had 3 Ks. Lincoln Holdzkom pitched 2 scoreless innings. He did not allow a hit while walking 1 and striking out 2. Bryce Cox pitched 2 scoreless innings while allowing 3 hits. Beau Vaughn pitched a perfect last inning with 2 KS. Lancaster defeated Inland Empire 7-2. Cory Keylor went 2 for 5 and scored a run. Zach Borowiak went 2 for 4 with 2 RBI. Jacoby Ellsbury went 1 for 4 with a RBI. Mike Bowden started and earned the win. He went 5 1/3 innings. He gave up 2 runs on 7 hits and 2 BB. He had 4 Ks. Hunter Jones threw 1 2/3 innings of scoreless relief. He allowed 1 hit and 1 BB. He had 1 K. Chad Rhoades pitched the final 2 innings. He did not allow a run on 3 hits. He did not give up a BB. Zach Daeges went 3 for 4 with a run scored and a RBI. Chris Turner went 2 for 3 with 2 home runs. Scott White went 1 for 3 with a home run and 2 RBI. Iggy Suarez went 2 for 4 with a RBI. He is now hitting .379. Greenville lost to Asheville 4-3. Chris Jones started and took the loss. He went 3 innings giving up 4 runs on 7 hits. He had 1 K. Adam Blackley went 3 scoreless innings. He allowed 2 hits and had 3 Ks. Jorge Rodriguez threw 2 scoreless innings giving up 2 hits and no BB. He had 2 Ks. T.J. Large finished up with a scoreless inning. He allowed a hit and a BB. Argenis Diaz went 1 for 4 with 2 RBI. Kris Negron went 1 for 3 and scored a run. Player of The Night: Chris Turner whose 2 home runs helped lead Lancaster to victory. 4/21 Cup of Coffee: Another good day of weather enabled a full slate of games to be played on Friday. Rochester defeated Pawtucket 6-2. David Pauley got the team off to a good start by throwing 6 scoreless innings. He gave up 2 hits and 2 BB. He had 9 Ks. Bryan Corey took over going 1 1/3 innings. He gave up 2 runs on 3 hits and a BB. He had 2 Ks. Manny Delcarmen went 2/3 of an inning. He allowed 4 runs on 4 hits and a BB. He had 2 Ks. Travis Hughes threw 1 scoreless inning giving up 1 hit while recording 1 K. Brandon Moss went 2 for with 2 RBI and raised his average to .308. Joe McEwing went 1 for 3 and scored a run. Portland defeated New Hampshire 5-2. Andrew Dobies started and picked up the win. He went 5 scoreless innings while allowing 4 hits and a BB. He had 2 Ks. Kyle Jackson went 1 2/3 innings allowing 2 runs on 3 hits and a BB. He had 1 K. Mike James pitched the final 2 1/3 frames. He did not allow a run while giving up 1 hit and a BB. He had 1 K. Jacoby Ellsbury continued to dominate at the AA level. He went 4 for 5 with 2 runs scored and 3 RBI. He raised his BA to .500 and his OPS to 1.344. Jeff Corsaletti went 2 for 5 with 2 RBI. IN the California League, Inland Empire defeated Lancaster 5-2. Mike Rozier started and went 6 1/3 innings. He gave up 2 runs on 6 hits and a BB. He had 3 KS. Blake Maxwell blew the save giving up 1 run on 3 hits in 2 2/3 innings of work. Tim Cox took the loss. He went 1 inning allowing 2 runs on 2 hits and 2 BB. He had a K. Mark Wagner went 1 for 3 with a RBI. Iggy Suarez went 1 for 4 with a RBI. Bubba Bell went 1 for 4 and scored a run. Finally, Greenville edged Savannah 5-4. Jon Lester went 4 innings giving up 3 runs on 6 hits. He did not walk a batter while striking out 5. Travis Beazley earned the victory. He went 4 innings allowing 1 run on 4 hits. He did not allow a BB and had 5 Ks. Manny Arambarris went 2 for 4. Jon Egan went 1 for 4 with 1 run scored and 2 RBI. Carlos Fernandez went 1 for 4 and had 2 RBI. Player of The Night: Jacoby Ellsbury who had 4 hits, 2 runs scored and 3 RBI. The Lowell Sun Online is reporting that former major leaguer and NESN analyst Gary DiSarcina will manage the (class A, short season) Lowell Spinners when the New York-Penn League gets underway this summer. It had been previously been announced that Jon Deeble would serve as the team's manager, having filled that role last season. DiSarcina had been hired by the Sox during the offseason as a roving minor league instructor and scout. At the time of this writing there was no further information available as to why the change was made nor was there official confirmation of the change. The Lowell Sun story is linked below. Yesterday evening, the Boston Red Sox announced that the acquisition of LHP Daniel Haigwood from the Texas Rangers for RHP Scott Shoemaker and cash. Haigwood, who had been designated for assignment by Texas, was assigned to the Sox 40 man roster and optioned to AA Portland. The 6' 5" 23 year old split last season between AA Reading (Phillies) and AA Frisco (Rangers) going a combined 3-7 with a 3.58 ERA in 27 starts (146 IP). A 16th round pick in '02 by the Chicago White Sox, Haigwood missed the 2003 season following knee surgery (left ACL), was traded to Philadelphia in the Jim Thome trade and to Texas in '06 for LHP Fabio Castro. Haigwood's best pitch is his curve, his arsenal also features a good change up, sinker and a fringe-average fastball (four seam), reportedly in the 88-92 MPH range. While having a generally successful (if at times uneven) career in the Red Sox system, Shoemaker is not regarded as a prospect, but offers good minor league depth. Dustin Pedroia was called up to Boston on August 22 last year and since then has been anointed the starting 2B for the big club. Today, Dustin Pedroia graduates from being a prospect. Pedroia, generally a slow starter, has struggled in his first few months in a Red Sox uniform, hitting .184 in his first 125 MLB at bats. However, the front office still has faith that he will come around, and Pedroia is trying to stay positive despite his offensive struggles. SoxProspects.com uses the MLB "Rookie of the Year" eligibility to determine prospect status - once a player hits 130 at bats, 50 innings pitched, or 45 days on any MLB roster, he is eligible for Rookie of the Year. At that point, that player is also no longer a "prospect" for the purposes of this site. Thats why well-respected players such as Manny Delcarmen and Craig Hansen, while still considered to be future contributors to the Red Sox, are no longer considered prospects. Here's wisihing Dustin good luck in the 2007 season and the rest of his big league career! 4/20 Cup of Coffee: Finally, the Red Sox affiliates were all in action last night. Pawtucket split a doubleheader with Rochester. They took the first game 4-0. Mike Burns went 2 scoreless innings. He did not allow a baserunner and had 2 Ks. Craig Breslow got the win going 3 scoreless innings. He gave up 1 hit and had 3 Ks. Javier Lopez went 2/3 of an inning. He gave up a hit and a BB. He had 1 K. Edgar Martinez went the last 1 1/3 innings. He allowed 2 hits and a BB while striking out 3. Brandon Moss went 2 for 3 with a home run and 2 runs scored. Kerry Robinson went 2 for 4. In the second game, they went down to a 3-0 defeat. Devern Hansack went 5 1/3 innings. He gave up 3 runs on 8 hits and a BB. He struck out 3. Craig Hansen pitched the last 1 2/3 innings. He did not allow a run on 1 hit and a BB. He had 2 Ks. David Murphy and Jeff Bailey went 1 for 3. Chad Spann went 1 for 2. Portland finally got a game in but the rust showed as they fell 6-1 to New Hampshire. Clay Buchholz went 5 innings. He gave up 1 run on 3 hits and a BB. He had 8 Ks. Barry Hertzler took the loss. He did not record an out while allowing 1 run and a BB. Chris Smith went 2 innings allowing 4 runs on 3 hits and 2 BB. He had 2 Ks. Bryce Cox threw a scoreless inning while giving up a hit and a BB. Jacoby Ellsbury went 3 for 3 raising his average to .452. Dusty Brown went 1 for 3. Jed Lowrie went 1 for 4 with a home run. On the west coast, Vasalia defeated Lancaster 3-1. Justin Masterson took the loss going 5 innings giving up 2 runs on 6 hits and 2 BB. He had 3 Ks. Jason Blackey went the final 3 innings giving up 1 run on 4 hits. He had 1 K. Mark Wagner and Ryan Khoury both went 1 for 4. In a slugfest, Greenville defeated Savannah 13-9. Jordan Kraft went 4 1/3 innings allowing 2 runs on 3 hits and 4 BB. He had a K. Kyle Fernandes got the win going 1 2/3 innings. He did not allow a run while giving up a hit and a BB. He had 2 Ks. Eric Beattie went 2/3 of an inning. He gave up 4 runs on 2 hits and 2 BB. He had 1 K. Josh Papelbon went 2 1/3 innings. He allowed 3 runs on 5 hits. He had 3 Ks. Pedro Vasquez went 3 for 4 with a home run, 4 runs scored and 2 RBI. Lars Anderson went 3 for 5 with 2 RBI. Jon Still went 2 for 5 with 2 homers and 4 RBI. Zak Farkes went 2 for 5 with 2 home runs and 3 RBI. Player of The Night: Jon Still who hit 2 home runs and had 4 RBI in helping Greenville to victory. 4/19 Cup of Coffee: Once again, weather in the Northeast resulted in both Pawtucket and Portland being rained out. In California, Lancaster edged Visalia 6-5. Kris Johnson started and went 3 1/3 innings. He gave up 5 runs on 7 hits and 2 BB. He had 5 Ks. Hunter Jones picked up the win going 2 1/3 scoreless innings. He allowed 1 hit and a BB while striking out 2. Ismael Casillas finished the last 3 innings. He did not allow a run while giving up 1 hit and a BB. He had 3 Ks. Bubba Bell went 2 for 5 with a run scored. Zach Daeges went 2 for 5 and scored twice. Scott White went 3 for 5 with a home run and 5 RBI. Sal Paniagua went 2 for 4 with a RBI. Savannah edged Greenville 5-4. Brian Steinocher started and took the loss. He allowed 5 runs on 10 hits and 3 BB. He had 6 Ks. T.J. Large threw a scoreless inning. He did not allow a hit but gave up a BB. He struck out the side. Jason Place went 2 for 4 with 2 homers and 3 RBI. This week, in a very close race, Aaron Bates edged out Jacoby Ellsbury by three votes for SoxProspects.com Player of the Week honors. Lancaster's first baseman had a big week batting .435 (11/23), with 3 2B, 3 HR, 7 RBI, and 7/5 BB/K, while playing his first games outside the friendly confines of The Hanger (Clear Channel Stadium). The 23-year-old right-handed hitting product of North Carolina State University was the Red Sox third round selection in the 2006 draft. Pawtucket RHP Devern Hansack also received strong support in the voting. Forgive me if you already read my rant on the message board. But I'm a little upset that the Sea Dogs have already been rained out nine times during the first two weeks of the season and have only managed to fit in six games. Clay Buchholz's first start was delayed by six days, and now his second start has been slid back for five straight days. Many of the top prospects in Portland have been forced to twiddle their thumbs while several of the other minor league teams have already gotten in 12 or 13 games. The Dogs are already going to have to play at least six doubleheaders this season. Indeed, 2007 marks five years in a row in which there have been an absurd number of April rainouts in Portland. There can be no doubt that this many rainouts is detrimental to the players. No, I'm not upset with the weather gods or global warming. Those are fights for another day and another place. I'm upset because there's a fairly simple solution - start the Sea Dogs on the road next season. In fact, start the Sea Dogs on the road every season. Start them on a 10-game road trip every year, give them a 3-game home stand in mid-to-late April, then send them on another 6-game road trip. There's a multitude of reasons to start the Dogs on the road every year. First, the team has a 10-game road trip every year, might as well make it in April. Second, I understand that the entire East Coast has experienced bad weather the past couple days, but that hasn't been the case all season. The Eastern League has plenty of affiliates that see significantly better average April weather than Portland, including the whole Southern Division and Trenton. In fact, pretty much every team in the Eastern League has better average April weather than Portland. We're not talking about summer weather in April, but we're also not talking about a field buried under 10 inches of snow for the first week of the season every year. I'm sure the Portland fans wouldn't complain about getting less April games, as even when they manage to get in a game its still pretty cold up there in April. In the end, they'd probably end up actually playing the same amount of April games anyway. Scheduling less April games in Portland also means that the Maine fans get more warm-weather games to enjoy later in the season. I'd imagine the players won't complain either. If you were up-and-coming and hot-out-of-the-gates Jacoby Ellsbury, would you rather play a few road games to start the season, or sit around and play no games at all and then have to play six doubleheaders later in the season? The answer's a no-brainer if you ask me. Same goes for the opposing players. What about the opposing teams, you ask? Maybe they don't want to host games in April, either. Maybe they'd rather have as many games in June through August when the weather is great and school's out. Maybe they'd feel like they were getting the short end of the stick if they were forced to host games the first week of the season. Sensible arguments. But guess what - some team has to host games in April. If one team is going to have to get the short end of the stick, why must it be Portland rather than Trenton? This question lloms large, particularly when the ill-effects of the likely Portland rainouts in April will be detrimental to the players on both teams. If its the summer games that the teams value, schedule a significant portion of the April games at the homes of the Southern Division teams, and even that out by scheduling a lot of the May games in Portland and the Northern Division. While there's still a chance of some May rainouts in Maine, its significantly less of a risk than the first three weeks of April. After May, the teams can share equally in the valuable summer home games. Seems like a simple solution to me. But I imagine there’s a whole lot of politics that goes into the scheduling than meets the eye. I just hope those asserting their politics keep in mind what’s best for the players. 4/18 Cup of Coffee: Weather continues to be a major story with the Sox alliliates. Last night, the Pawtucket / Rochester game was rained out as was a scheduled doubleheader between Portland and Trenton. In California, Lancaster got by Vasalia 15-12 in a game which saw both teams collect 32 hits. Daniel Bard went 4 innings allowing 2 runs on 4 hits and 5 BB. He had 1 K. Tim Cox went 2 1/3 innings giving up 4 runs on 8 hits. He had 4 Ks. Chad Rhoades picked up the win going 2 1/3 innings. He gave up 6 runs on 3 hits and 3 BB. He had 5 Ks. Jason Blackey finished off the last 1/3 of an inning allowing 1 hit. Ryan Khoury went 2 for 5 with 2 runs scored and 2 RBI. Bubba Bell went 2 for 4 with a home run and 3 RBI. Jay Johnson went 3 for 5 with a run scored and 2 RBI. Mark Wagner went 3 for 6 with 3 runs scored. Iggy Suarez had a perfect night at the plate reaching base 5 times. He went 3 for 3 with 2 BB. He scored 3 times and drove in 3 others. Greenville bombed Savannah 12-5. Dustin Richardson went 5 innings allowing 1 run on 5 hits and 2 BB. He had 7 Ks. Adam Blackley went 2 innings giving up 1 run on 1 hit. He had 1 K. Kyle Fernandez went an inning giving up 2 runs on 2 hits and a BB. Eric Beattie went the final inning giving up a run on a hit and a BB. He struck out 1. Lars Anderson went 1 for 5 scoring twice with 3 RBI. Kris Negron went 2 for 4 with 2 runs scored and a RBI. Jon Still went 2 for 6 with a run scored and 2 RBI. Carlos Fernandez went 3 for 4 with 2 runs scored and a RBI. Player of the Night: Iggy Suarez who reached base five times and raised his BA to .422. 4/17 Cup of Coffee: Weather and scheduling made Monday a brief night for Red Sox Nation with only two games played. Pawtucket lost 5-2 to Scranton/WB. Kason Gabbard went 5 1/3 innings and took the loss. He gave up 5 runs on 7 hits and a BB. He had 3 Ks. Manny Delcarmen went 1 2/3 scorless innings of relief. He allowed 1 hit and did not give up a BB. He had 1 K. Alex Ochoa went 3 for 4 with a run scored and a RBI. David Murphy went 2 for 4 while Joe McEwing went 2 for 3. Their second game of the doubleheader was postponed. The Portland/Trenton game was also postrponed. In the only other game of the night, Rome edged Greenville 3-2 in 13 innings. Chris Jones went 6 innings allowing 1 run on 3 hits and 0 BB. He had 4 Ks. Jorge Rodriguez went 5 innings. He gave up 1 run on 3 hits and 0 BB. He had 1 K. Felix Ventura went 2 innings giving up 1 run on 2 hits and a BB. He had 2 Ks. He also took the loss. Manny Arambarris went 4 for 6 with a RBI. Jon Egan went 2 for 6. Player of the Night: Manny Arambarris who went 4 for 6 in a losing cause. 4/16 Cup of Coffee: On Sunday rain swept through the northeast washing away both the Pawsox and Seadogs games. The Pawsox will play a doubleheader on Monday to finish out the series with Scranton Wilkes Barre. Portland will start a series with the Trenton Thunder at Hadlock Field. In Lancaster Michael Bowden had his 3rd straight impressive start as he pitch 5 2/3 innings giving up no runs on 2 hits while striking out 5 and walking 1. Hunter Jones pitched 2 1/3 scoreless innings but the Jethawks fell to Inland Empire 1-0 in 12 innings. Kevin Guyette took the loss for the Jethawks. Zach Daeges led the Jethawk offense by going 3/5 with 2 doubles in the loss. In Greenville the Drive swept a doubleheader from the Rome Braves. Adam Blackley won the suspended game as he pitched 3 innings giving up no runs on 1 hit and striking out 2. Josh Papelbon closed it out for his 3rd save of the season. The offense was led by Lars Anderson who went 2/3 with 2 walks and 2 runs scored and Jon Still who went 2/4 with a triple, 2 rbi's and 2 runs scored. In game 2 Travis Beazley pitched 5 2/3 innings for the win as he gave up 3 runs on 6 hits while striking out 9. Zak Farkes went 2/2 with 2 homeruns and 3 rbi's while Manny Arambarris went 2/3 with a triple and 2 runs scored. Player of the Night: Michael Bowden who pitched 5 2/3 scoreless innings for Lancaster while striking out 5 and walking 1.